My oldest son was born on Valentine’s Day. The first time I held him, and felt that fuzzy warm head nestling snugly under my chin, motherlove—beautiful, life-changing motherlove—bloomed and blazed in me. He was perfect! And he was followed, over the next few years, by two perfect brothers. Oh, those early years! I loved mothering that puppy-pack of boys. I didn’t worry that my oldest was mostly silent, ignored other kids, and preferred to line up toys rather than play with them. At Christmas, when he was two, I lined up all his little gifts in a long row on the carpet. What fun! I didn’t worry that his brother only talked about Thomas the Tank Engine. We just played trains. A lot. So many trains! After that, birds. We both loved birds, drew birds… hundreds of birds. Every day, we drew birds! “All those four-year-olds banging drums and cymbals? I’d hide too,” I’d laughed. I could not see symptoms. All I saw were boys who played and thought and moved and spoke (or not) in their own unique, special, quirky ways. Why didn’t I see symptoms? In part, because back then, awareness was less. And in part, because I had been this same kind of child. I, too, had lined up my toys, gagged at lumpy food textures, rocked and covered my ears at loud noises, got obsessed with special interests, and felt uber-shy around others. Things weren’t easy for me, in childhood. And adolescence? Let’s not talk about it. But I’d survived. I’d grown into a responsible, independent, happy adult. My sons would, eventually, too. What was the problem? Well, it had something to do with autism, in all its frustration and worry and joy. I didn’t receive my own diagnosis until my sons were young men—not until after I’d written my first children’s novel, The Someday Birds. Charlie, in the novel, is a bird-loving boy on a wild journey across the country who learns to feel a bit more at ease in the world. I started the project as a heart gift, a memory of the boys’ childhood, but I’d found that writing it was triggering for me in terms of my own childhood. It put my own memories under the microscope in a way I’d never looked at before. After much deliberation, I decided to get formally tested. And receiving my adult diagnosis was a huge life-changing event. It answered so many questions, made so many things about my past finally click into place. And it’s allowed me to speak from the heart, from a place of knowing, to schoolchildren, now. This has been autism’s biggest gift to me, personally. I travel around, talking to kids about books, and growing up, and autism. I ask, “How many of you have an autistic friend, or classmate, or relative?” And every hand goes up. We talk about flapping, and stimming, and special interests, and getting the wiggles out, and how it’s all pretty much natural—how autistic behavior is human behavior, writ large and maybe a bit extreme sometimes, but still totally familiar and human…. And we talk about how we all grow, mature, and change. For years, I’ve felt guilty for missing some of my boys’ early symptoms, back in those puppy-pack years. But now I think that in some important ways, I did them a favor by loving them so wildly, madly, ignorantly, and completely, just as they were. Because the underlying message was: You are you. I love you. You are not lacking, or wrong. It’s all fine. We are all flawed people, on this earth—all of us. We all need grace in our lives, and love, so much love. And we need forgiveness. We need to be given the benefit of the doubt now and then, and to be listened to and respected. Because life can be a difficult journey. And learning how to feel at ease along the way—how to connect, respect, and love along the way—is the best we can hope for. 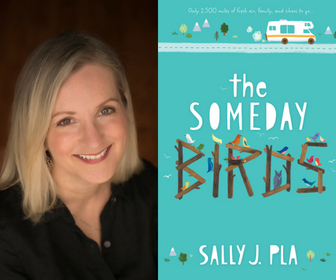 Sally J. Pla is an award-winning author of books for young people and the young at heart. She is an autism advocate who believes in kindness, respect, and the beauty of different brains. We are all stars shining with different lights. Sally is available to visit with book clubs (virtual or in-person) via NovelNetwork! Educators, consider inviting Sally to visit with your students!